George Graham Reviews Jamie Cullum's "Catching Tales"
Jazz-influenced vocals are making a comeback in popularity. Norah Jones' hit album in 2002 helped to pave the way for a new generation of chanteuse style female vocalists. I suppose that the male counterpart would be a crooner, and term that goes back to Bing Crosby. Interestingly, while there are many talented young women chanteuses, the male crooners making an impact on the pop scene are mostly aging rockers, with Rod Stewart being the best-known example, but also Boz Scaggs taking up the style. This week we have the second album by a young male crooner who met with considerable commercial success the last time out. But this time, he is doing less the jazz style, and being more the singer-songwriter on his sophomore release. 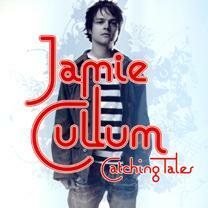 He is Jamie Cullum, and his new CD is called Catching Tales. For as American as the jazz-influenced crooner style is, Jamie Cullum is British -- he was born in Essex and raised in Wiltshire. His first major-label release in 2004, Twentysomething -- an accurate reflection of the age of its creator -- proved remarkably popular, selling over a million copies around the world. Perhaps it's another example of what happened back in the 1960s with the British Blues movement, in which young Englishmen took a very American style and made it hip for pop audiences. In any case, Cullum grew up listening to lots of different styles of music, from rock to hip-hop to blues. He took up the piano, and his introduction to jazz came when he was in his teens, discovering Miles Davis and Herbie Hancock. His older brother Ben Cullum, who plays bass on Jamie's albums, had taken an interest in Steely Dan's music, and that also proved to be influential to Jamie. In college, Jamie began taking piano and vocal gigs, playing the usual weddings and even on cruise ships. Cullum released a couple of independent CDs, mostly of covers of jazz standards, before being signed for his debut major label release, on which he mixed jazz standards with original music, and applied youthful energy to the venerable songs, and developing a performing style that had him jumping on the piano. Twentysomething was an unexpected hit here in the US, and established the now-26-year-old as someone to watch. Now on his new CD Catching Tales Cullum moves more into the realm of eclectic singer-songwriter, with his playing guitar on some songs, and also employing such techniques as sampling and working with a producer who goes by the name of Dan the Automator, who had worked with the cartoon band Gorillaz. But most of the CD is produced by the gentleman who handled Twentysomething Stewart Levine, a veteran going back to working with artists like the Crusaders in the 1970s. My own attitude toward crooners is that the definitive recordings of the old standards have already been made by people like Frank Sinatra and Tony Bennett, so any new version of those songs by a male vocalist is likely to be compared, and probably unfavorably to the originals. So I am pleased that Cullum is emphasizing the singer-songwriter facet on his new CD. His songs are quite worthy, and the variety of sounds and styles -- from funk to ballads -- makes this, for me, a more satisfying effort that Twentysomething. Cullum is a good writer, though his songs sometimes have a tendency to become a pastiche of different styles. Lyrically, he can bring in a clever turn of phrase, showing his influence by the Tom Pan Alley songwriters who wrote the jazz standards. But one can also hear some Billy Joel influence in the CD. In addition to his brother Ben on electric bass, Jamie Cullum is joined by three different drummers at various times, Ian Thomas, James Gadsen and Sebastiaan de Krom, and there are various acoustic bass players, sometimes appearing on the same tracks as with the electric bass. Cullum himself plays a variety of keyboards and does manipulating of samples and rhythm loops, and he also is heard on guitar on a couple of tracks that can sound downright folky. Young British pianist and vocalist Jamie Cullum on his new CD Catching Tales has made a transition from being primarily a jazz-style crooner to an eclectic and appealing singer-songwriter. Although a bit of a novelty, who proved quite popular, there was something about an energetic English 20-something, who looks even younger that that, singing jazz standard ballads that did not quite ring true, and it was probably not the kind of thing that would sustain a durable career. Turning his attention to original songs, many of them outside the jazz-influenced sphere, proved to be a very good move artistically on his part. His abilities as a writer and his musical versatility are more apparent and mark Cullum as being more than a novelty act, but a worthy and original artist who has now carved out his distinctive musical niche. Our grade for sound quality is close to an "A." There is good sonic clarity, and the heavy overdubbing, with Cullum playing and singing many parts at one time, is well handled and natural-sounding. The dynamic range is also better than the contemporary average. Jamie Cullum became a hit as a young British crooner, dressed in denim, jumping on the piano, and singing old jazz standards. Catching Tales shows Cullum branching out as a more original artist. Whether his popularity, based perhaps on the novelty of his crooner persona, will persist on the new CD remains to be seen. But from an artistic standpoint, his new recording is his best musical effort by far.